After the patient’s general condition has reached optimal conditions for operation, there are several steps to be taken in the few hours just preceding operation. Bowels. For certain operations attention to the bowels must be given. Prolonged bed rest and inactivity during hospitalization, the sedative effects of the anesthetic, as well as the sedatives themselves, may make the bowel action sluggish after operation. Cathartics may be given a day or two prior to operation, but more often today a mild enema is given the morning of operation or the evening before. Your surgeon may or may not deem an enema before operation necessary to your postoperative comfort. Bladder. Similarly, the bladder action may be temporarily impaired for a few hours after oper­ation. Therefore the bladder must be emptied before the operation is begun. The patient will be told when to void just before being taken to the operating room. In some instances, such as operations in the lower part of the abdomen, the surgeon may want constant drainage from the bladder to keep it completely empty. Thus, a catheter is inserted into the bladder to insure continuous drainage during operation. This may also be done when a prolonged operation is contemplated in any region. Hair “Prep.” All hair must be shaved from the part to be operated on. Standard techniques are established for this and are ordered by name by the surgeon. This is commonly referred to by the hospital staff as the “prep.” It is usually done the evening prior to the day of operation. An orderly will prep the male patients, and a nurse or a nurse’s aide will prep the females. All hair must be thoroughly shaved over a sufficiently wide area. Do not become critical of the at­tendant who prepares the area for your opera­tion; he has definite instructions. In some cases, frequently in bone operations, a special tech­nique is used to prepare the skin, using antiseptic solutions and sterile bandages which are left in place until operation. Usually, however, shaving the hair away is all the skin preparation that is done in the patient’s room. Bath. The patient is usually instructed to take, or is given, a bath or shower the evening before the operation. This is to insure body cleanliness and add to postoperative comfort. For a few days after the operation a “bed bath” is all that can be allowed. NPO. If general anesthesia is to be used for the operation, it is extremely important that the patient have an empty stomach when entering the operating room. If there is food, either solid or liquid, in the stomach, there is likely to be vomiting during anesthesia and while recovering from the anesthesia. This is particularly to be avoided while the patient is anesthetized because of the likelihood of aspirating (sucking) some of the vomitus into the lungs, to produce pneu­monia; while reacting from the anesthetic it is of concern for the patient’s own comfort. Thus, there will be a period of several hours before operation when nothing will be offered to eat or drink. The importance of this cannot be over­emphasized. There must be absolutely nothing taken by mouth during this period specified by the surgeon or anesthetist, as just a little residual in the stomach may cause vomiting. A sign may be placed on your bed during this period, so that all will know you are to have nothing by mouth. In most hospitals it reads simply “NPO,” mean­ing nil per os (nothing through mouth). The usual procedure is to withhold all solid food for a period of 8 hours or longer and all liquids for 6 or more hours prior to the scheduled time of operation. (Ordinarily, the emptying time of the stomach is about 4 hours, but with the usual apprehension of the immediate preoperative pe­riod emptying may be delayed; so a safety margin of a period longer than 4 hours must be used.) Your surgeon will not make the period an undue length of time; to be sure, he will not want you to become at all dehydrated before operation. He will calculate the time specifically for the individual needs. Co-operate in this respect 100 per cent; it is the patient who pays the conse­quence if there is an infraction. The NPO period is sufficient reason in itself to admit a patient to the hospital several hours before the scheduled hour of operation. Rest. A person who is to undergo a major operation or major anesthetic should be well rested. The apprehension or the strange bed and surroundings may not be conducive to sleep and an adequate night’s rest. Every effort is made to make the patient feel at ease and help him adjust to the hospital routines and the new environs, but to assure sound sleep a sedative is most often given the evening before operation. It may be repeated through the night or again in the morn­ing, whatever the surgeon deems necessary. A standing order may be left with the nurse to give a mild sedative as often as necessary to obtain sufficient sleep and rest. Visiting. Visiting and other activity may be curtailed on the evening before operation to avoid undue excitement. A brief visit with the closest relative may be allowed on the morning of operation. Visitors shall remain in the waiting rooms until beckoned. No doubt the surgeon will speak with them after the operation but prob­ably he will not have the opportunity imme­diately beforehand. When the patient responds from the anesthesia, the closest relative may be allowed a brief visit again. Preoperative “Hypo.” This is a drug or a combination of drugs given by hypodermic injection to facilitate not only the operative procedure but the anesthetic as well. The drugs are employed to allay the anxiety and apprehension of the patient, to reduce the metabolic rate and thereby permit the induction of anesthesia with smaller quanti­ties of the anesthetic agent, to reduce the amount of secretions in the mouth and throat and thereby maintain a clear airway, and to obtund certain undesirable reflexes. The drug is given from 30 to 90 minutes before anesthesia is to begin. Occasionally more than one hypo is given. The drugs and dosages are ordered by the surgeon or physician-anesthesiologist to be given at a specific time. These are calculated according to the surgical procedure, the anes­thetic agent to be used, and the individual pa­tient. Often it is not possible to predict the exact time an operation is to begin due to a delay or change in the operating room schedule; in this case the hypo may be ordered “on call” from the operating room, and at the proper time the nurse is called by phone from the operating room with instructions for the hypo to be given. Final Preparation. There may be several other steps in the final preparation of the patient by the nurse. The patient must be clothed in the regulation hospital gown which ties in the back. Occasionally other special operating room garments are worn. The mouth is inspected for false teeth or dentures and chewing gum. All dentures and jewelry must be removed before going to the operating room. All articles of value may be left in charge of the head nurse after labeling clearly; if desired she will give the pa­tient a receipt. If the patient has any real objec­tion to the removal of the wedding band, it may be taped to the finger or attached by string to the wrist. In women all hairpins are removed, and, if the hair is long, it is plaited into braids. The head is covered with an operating room cap. All patients will be instructed to void just before going to the operating room. If a catheter has been ordered by the surgeon, it will be inserted before leaving the room for the operating room. Transport to Operating Room. The patient is transported to the operating room by a prede­termined schedule or by call from the operating room that they are ready for the patient. Usu­ally this is done on a hospital cart (wheeled stretcher), but occasionally the patient is trans­ported in his bed. The latter means is used when it is wise to move the patient as little as possible and when there are traction devices attached be­tween the bed and a fractured limb. Needless to say, the hospital carts are not so comfortable as the bed, but the time spent on them is brief. A pillow and sufficient blankets are provided to add comfort and guard against chilling. Special attention is given any painful area. Adequate personnel are on hand to lift the patient to the cart if the patient is unable to move himself over on it. The carts are the same height as the hospi­tal beds to make the transfer easier. The patient is then wheeled to the elevators and hence to the operating corridors. In the Operating Room. 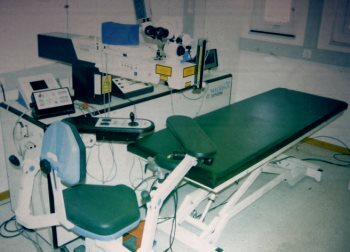 When the patient reaches the operating suites of the hospital, he remains on the cart with an attendant until the notice is given to bring the patient into the operating room. The cart is then wheeled adja­cent to the operating table and the height of the table adjusted to that of the cart. The pa­tient is then moved over onto the table and the cart taken away. Some hospitals are equipped with an anesthetizing room adjoining the operat­ing room. Here the patient is placed on the operating table, and wheeled into the operating room after anesthesia has rendered the patient asleep. In either case, the patient is made com­fortable in the operating position; a last-minute check of the blood pressure, pulse and respira­tory rates is made, and the necessary arm straps applied, before the anesthesia is started. If re­gional or spinal anesthesia is used, a position dif­ferent from the operating position may first be assumed. What’s new in surgery ?